"Vitaly has nailed the things you need to think about as you start a company." Silicon Valley Venture Capitalist and Serial Entrepreneur teaches how to succeed in taking your startup from idea to product to company. Accelerated Startup takes entrepreneurs through the startup minefield from fostering revolutionary ideas to building the right team and launching the product to raising angel and venture capital to finding the first 10,000 customers and ultimately taking the company to a successful exit. It is filled with practical lessons learned from years of hands-on experience, until now, available only in top startup accelerator programs. "As startups take over the world of business, understanding how to create one is more important than ever. Vitaly explains how it is done in Silicon Valley, where the lessons can be applied to any entrepreneur in the world." "This book is filled with wisdom about entrepreneurship, fundraising and startup life (including its compromise). It is a valuable read for anyone interested in business, regardless of where they are in their own careers." "The book I wish I had read before embarking on the crazy journey of tech entrepreneurship." 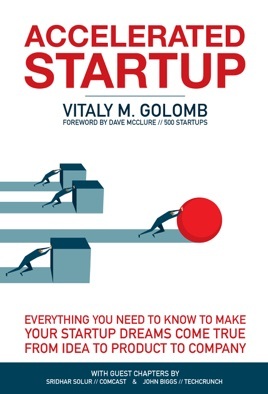 Vitaly M. Golomb is one of the most dynamic and in- demand speakers and trainers in the world of startups, venture capital, and corporate innovation. A serial entrepreneur in the Silicon Valley trenches since his teenage years, he is the Managing Partner at GS Capital. He was previously a founding Partner at HP Tech Ventures, the corporate venture arm of Silicon Valley’s original startup, where he was recognized as a Global Corporate Venturing Rising Star, and a three times CEO. He is a contributing writer to TechCrunch and a top-ranked mentor by accelerators and business schools in the US, Europe, and Asia. Mr. Golomb lives in the San Francisco Bay Area and travels to over 20 countries each year to consult and speak for major conferences, corporations, associations and universities on entrepreneurship, innovation, and design. His ability to break down complex concepts and inspire, educate, and delight audiences across industries and cultures, is second to none.